TALLAHASSEE, Fla. — An underrated Spring Break tournament, Tally Classic often brings a nice blend of elite competition and Spring Break shenanigans. This year’s tournament didn’t have the same number of elite teams as usual, but there were certainly enough to keep things interesting. Over the course of the weekend, a few stories emerged. Here’s a look at the biggest and most important among them. It was clear very early on in the final — and really all day Sunday — that there was a gulf of talent separating UNC Wilmington from the other teams at Tally Classic. Central Florida may have been the undefeated team between the two, but by the time Wilmington took half in the final, they were already up four breaks. From there, Wilmington coasted to a 15-10 win to take home the Tally Classic crown. Sunday was windy, and a lot of games were characterized by the trading of downwind holds, but Wilmington broke upwind twice early in the title match. Each time, they completed the break downwind immediately afterward. Central Florida was never able to claw back into the game. The biggest difference between the two teams was Wilmington’s litany of two-way players. The Seamen didn’t play with O-lines or D-lines all weekend. Instead, just about everyone who played for the team played both ways. Certain players like J.D. Hastings, Kevin Mateer, and Kyle Warfel (defense) and Willie Stewart, Grayson Sanner, and Colin White (offense) were used more frequently one way or the other, but Wilmington sought to use an army of strong, multi-talented players to knock out opponents with fearsome efficiency. When Central Florida didn’t have Michael Fairley or Kyle Reedy on the field, their offense sputtered and their D-line couldn’t score. When Wilmington’s offense turned the disc—and it didn’t often—they played impressive defense and got the disc back every time, not getting broken once. When their defense generated turns, their offense didn’t skip a beat going the other direction. “We have some flex in between lines,” said head coach Brian Casey, back with the team after serving his suspension from USA Ultimate, after games on Saturday. “It’s more about trying to get players that are playing well together, as opposed to having true O [and] D-lines. [It’s] a little bit of riding the hot hand, seeing what works, and just trying out some stuff because we have a lot of chemistry still to gain.” Their chemistry didn’t appear to be lacking at all against UCF. The team also varied who they used to slow down Central Florida’s biggest players. Mateer, Rick Henninghausen, and Jack Williams all took turns guarding Fairley, which meant the UCF star not only played against fresh legs all game, but also never got a chance to get comfortable against any one defender. Offensively, Stewart was consistently the team’s primary handler, but Williams, White, and Sanner also all contributed in the backfield. Williams, understandably, was used at all depths of the offense. He appeared not to need his highest gear; his play seemed effortless. When an IO break flick missed its target in the second half, the mistake was jarring. But his biggest burst of jaw dropping play earlier in the half, when he absolutely posterized a UCF defender for a goal, meant he probably was permitted that rare error. McGrayne led the team in scoring in final with five goals, though Danny Mercer, who had been absent on Saturday, gave him a real run for his money. Truly, the depth of Wilmington’s solid veterans overwhelmed every team they played on Sunday, UCF included. The Seamen have two very bright freshmen contributing major minutes as well. Matt Ellis and Connor Russell both had solid finals and really strong weekends. Ellis is a tremendous athlete and made highlight reel plays on both sides of the disc while Russell, long and with strong throws, was a key part of the UNCW offense. Both players earned praise from Williams after the game. UCF didn’t play their best game, especially early. But Wilmington made it clear that they were the best team at the tournament with a really impressive performance from start to finish. And the manner in which they did it shows that the ceiling for this team could be even higher. The road to the final wasn’t quite as clean as their performance in the final itself, however. A stunning upset to Emory in their second round of pool play was reminiscent of the team’s loss to Tulane a year ago at this tournament. 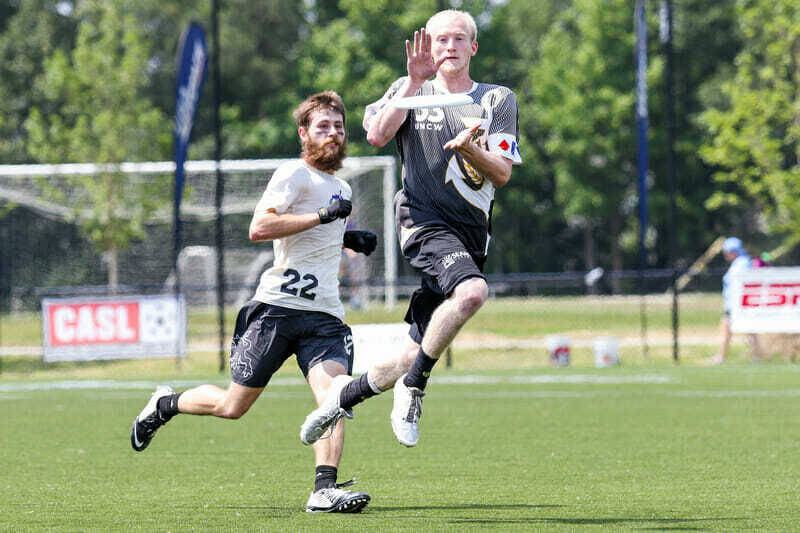 Emory came out and played nearly perfect ultimate for the first half and then weathered the storm in the second to upset the top seeded Seamen. This year’s Seamen seemed to better respond to that early upset than last year’s squad, which lost to Auburn in the final here in Tallahassee. The loss to Emory really seemed to wake the team up. Wilmington outscored their opponents 75-42 in their remaining four games, including beating Florida and Central Florida by a combined scores of 30-19 in semis and the final. Perhaps the biggest boon for Wilmington was getting their coach back. After being suspended by USAU, Casey made his first appearance on the UNCW sidelines of 2017. Williams thought the return of their coach was an invaluable addition. The one knock on Wilmington’s weekend—apart from the loss to Emory, of course—will be the level of competition. Central Florida and Florida, the two best teams this weekend after UNCW, are nice teams but they’re not top 10, or maybe even top 15, caliber right now. Wilmington looked as good as they realistically could have hoped against those two, but it probably won’t be until they play true title contenders later in the season that we can know if this team is in that class or not. Still, a strong weekend at Tally is something for them to build on, and they definitely showed the potential for being a team that can compete with anyone. The question in the Southeast has been the same all season long: how will the second tier teams position themselves behind Georgia? After Tally Classic, we’re starting to get a better idea of what the answer is. Central Florida and Florida have separated themselves as the second tier in the Southeast, at least for now. Florida probably had the better tournament overall, but Central Florida probably had the higher ceiling of the two. Though they lost in the final, and played some tight games with teams they probably shouldn’t have, UCF showed that they have strong players beyond just Fairley and Reedy. Austin Koffarnus is a solid defender, Austin Malone is a reliable goalscoring option, and Ben Ostman and Jake Larsen pilot a sturdy backfield. Central Florida’s two biggest problems right now are failing to have their full roster available and maintaining positive energy throughout the course of a game and tournament. Though they had much better numbers than they did for Warm Up, they were still without three starters in Cole Friedes, who suffered a bad ankle injury at Warm Up, James Dangler, and Zach Good. Of course, still having a solid tournament performance without a full roster is a positive indicator for a team’s ceiling, but until all those players start playing together, it will be tough for UCF to know exactly what kind of team they are. And it was. Central Florida demonstrated the ability to grind out wins against pesky opponents and that’s a promising sign for a team that’s still relatively inexperienced. But UCF also need a player or two to step up to form a more consistent support system for Fairley and Reedy. There are plenty of role-players—and a few that have flashed big play potential—but this weekend Central Florida was over-reliant on their big two to come up with the game-changing plays. One or two players taking on more responsibility in each game could change the shape of UCF’s season and help them compete at a higher level. Florida, in a sense, had a weekend opposite to their Central Florida rivals. Florida had inconsistent weekends from some of their top players, but depth players like Evan Murray and Parks Weatherford really stepped up and had strong tournaments. Murray is probably the number six or seven guy on the Florida O-line, but he has no glaring weaknesses in his game. He’s a capable thrower, and showed a real knack for scoring this weekend as well. Weatherford is one of the team’s top defenders and even in his first year on the team after four years on the B team, he’s one of the D-lines top offensive players as well. Still, even with the depth of the roster being more reliable than it has been in recent years, Florida’s top dogs have to play better for them to compete with elite teams. Right now their biggest problem might be their mental strength, as it’s now becoming a trend that one mistake, or one break given up, becomes many. This weekend it was against Indiana, when they nearly blew a huge lead in quarterfinals, and to Wilmington in the first half of semis, but it’s been something that Florida has been prone to all season. “Learning in that position, you make a mistake, forget about it, you go back to being the player you are, not augment any mistake you made previously. That’s something that everyone of the players before has had to learn,” he said. Florida’s tournament didn’t end well, with the 15-9 defeat to Wilmington in semis and then a 13-9 loss to Cincinnati in the third place game that they clearly weren’t up for. But they showed an ability to tough out wins, like the Indiana game, and when they broke on double game point to defeat Cincinnati in pool play on Saturday. For Van Auken, that’s key. “We’re learning to win. Winning pools, winnings quarterfinals, all of that adds up in the end to what our goal is, which is to win Regionals, make Nationals. This is a group that has to learn what their style of doing that is,” he said. This is a team that not only lost Bobby Ley, but also Jacob Dummeldinger, a too-often overlooked leader for them the last couple of seasons. Their ceiling may not be as high as Central Florida’s, but they have the parts to compete as well. If this Florida team is able to figure out how they best win games, then they will absolutely be in the mix come Regionals. One Southeast’s team whose outlook isn’t as rosy is Florida State. They really have a problem on defense right now. They struggled to generate turns against competent offenses and their D-line offense struggled against weaker teams that make unforced errors. Breaking just once on a mere handful of chances against Cincinnati in quarters perfectly epitmoized that issue. Their offense is strong, led by Peter and Avery Van Brussel in the backfield and Stephen Muir downfield, and they scored consistently all weekend save for their consolation game against Notre Dame. But they just don’t have the defense to beat good teams right now. Their offense will keep them in games to the end with just about anyone, but they have to learn how to win games on defense too. It is a young team, but it’s still startling to see a Florida State team, which rose to the tops of the division thanks to their pride in their defense, struggle to force turnovers. LaRocque believes that the team is doing the right things, though, and that the turns will come if the team continues to improve. All young teams go through their growing pains; Florida State is working through theirs right now. If they are able to work out the defensive issues this season, with their offense, they could pose a real threat to the top teams in the Southeast. As of now, they aren’t quite there yet. Beyond Wilmington and the development in the Southeast, there were several fun storylines to emerge, befitting of the spring break atmosphere. Notre Dame, who wound up finishing a very impressive fifth overall (after arriving seeded ninth), had more fun than any team did last weekend. An especially cool moment was when the women’s team (who wound up winning the Women’s Division) came to support the Men’s final game of pool play. An army of over 50 ultimate players, all clad in cotton sleeveless camouflage t-shirts, cheered and appeared to enact some sort of tribal dance involving plastic oars and an inflatable pool raft. No team came even remotely close to being as loud as they were in that moment. The fun on the sidelines translated to a looseness and confidence that carried over onto the field against all of their opponents. Papal Rage lost only to Wilmington and Central Florida (to whom they gave a real scare in quarters), had two impressive wins against Emory and Kennesaw State in pool play, and then blew out Florida State and Georgia Tech in consolation play. The team’s care-free attitude is best exemplified by primary handler Jacob Scobey. It felt like about 50 percent of his throws over the weekend were hammers—and most of them worked. Luke Brennan is the main that anchors the defense, but mostly Notre Dame has a ton of solid role players that they rely on to keep legs fresh and grind teams down. Head coach Dave Hoffman acknowledged the impact the team’s fun nature has on the field, but also emphasized that he has a team of talented players at his disposal. “It’s definitely been a big part of it. It’s been a part of Notre Dame ultimate for a long time. But we’ve translated, with fundamentals and keeping the fun, we’ve become a very good team over the years,” he said. Notre Dame has Huck Finn next on the schedule, battling for relevance in what should be a competitive Great Lakes region. Based on their weekend in Tally, they should have lots of fun at both of those tournaments, and probably win a fair few games as well. Emory had a weekend of crazy ups and downs. They were the only team to beat Wilmington all weekend and the way they did it wasn’t a fluke. But they also lost to Kennesaw State, and Union, and got blown out by Notre Dame on Saturday. Anders Olsen is no doubt one of the best players in the region, and Mike Bartell and Daniel Sperling are also stellar. But they’re also young and the rest of the roster lacks experience. Juice was without Ishaan Dave, who is probably the team’s number four, and that certainly didn’t help. But the team’s key role players like Everett Dang are still so young and the program is still learning how to compete over the course of the weekend. Winning out on Sunday will help keep the sour taste from Juice’s mouth, but those were all games that they should have won. Had Emory made the bracket, it would have been very interesting to see what they could have down in quarters, but a huge win against Wilmington will be a nice enough prize to take back home. In fact, third year head coach T.J. Martin said it was the most proud he’s ever been of a win, if it wasn’t outright the program’s biggest in his time at the helm. The win demonstrated the potential in this young Emory team. Their top three, when at their best, are enough to give plenty of teams trouble. And in a year or two, they could be one of the favorites in the Southeast. But the team’s Saturday inconsistencies also showed where this team has room to grow. Cincinnati, like Emory, had a weekend of ups and downs. But Cincy’s strong third place finish is how they should remember their trip to Tallahassee. The team is replete with big, athletic players and they pride themselves on their physical play. Ironically, though, the smaller Jacob Turner and lanky Keegan North might be the two best players on the team. They certainly had the two most impressive weekends at Tally Classic, Turner especially. He’s a solid handler defender and the D-line’s quarterback when the team gets the disc. But he also showed a real nose for the endzone, knowing exactly when to leave the backfield space to punch in a possession after leading the team most of the way down the field. O-line mainstay Justin Latz noted the team’s D-first attitude and how the offense feeds off the defense’s success. “It is huge. It lets us push off the little mistakes we make. It doesn’t give us the pressure of the world on our ends. For tournament purposes, they drive it home for us, definitely,” he said. Cincy had one heartbreaking loss to Florida on Saturday. After going taking half 6-4, they let Florida retake the lead late in the second half. When they broke again right before the end of the game to go up 10-9 it looked like they’d win. But Florida broke back on the final point of the game to win 12-11. They then lost to Clemson in the last round of pool play after they’d already locked up a spot in quarterfinals. But Cincinnati played the three top Florida teams really well on Sunday. They beat FSU on double game point in quarters, were neck and neck with Central Florida until the final few points in semis, and then beat Florida fairly handily in the third place game. That strong finish is how Cincinnati should remember their trip to Tallahassee, and it gives them a strong result to build on for the rest of the season after a listless start earlier in the year. Clearly this year’s Tally Classic didn’t lack for excitement. But it’s still a shame that more of the top teams didn’t flock to Tallahassee this year. The fields are top notch and the weather is consistently wonderful. It’s also near some of the best beaches in the country at a time of year when many schools are on spring break. Next year and beyond, there’s no reason the likes of North Carolina, Georgia, and others shouldn’t come to Tallahassee and make Tally Classic one of the biggest and best tournaments of the year. Comments on "Tally Classic 2017: Tournament Recap (Men’s)"